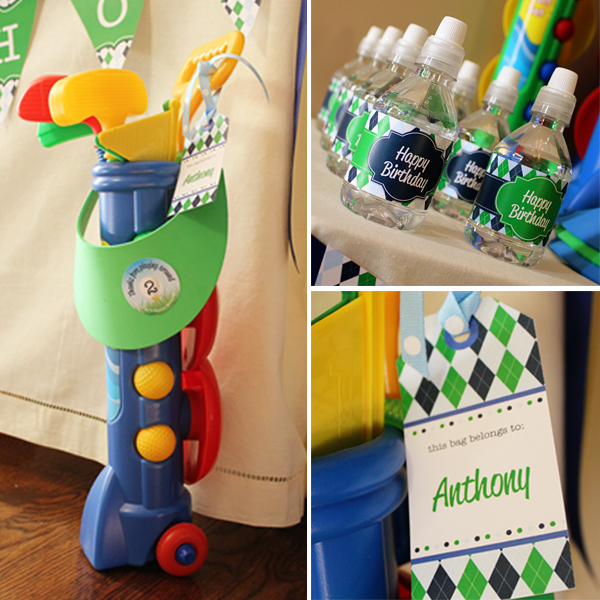 My little guy turned two over the summer and we celebrated with an oh-so-cute Golf Birthday Party. He is all boy and loves anything that includes a stick and ball, which made choosing the golf theme fairly easy. 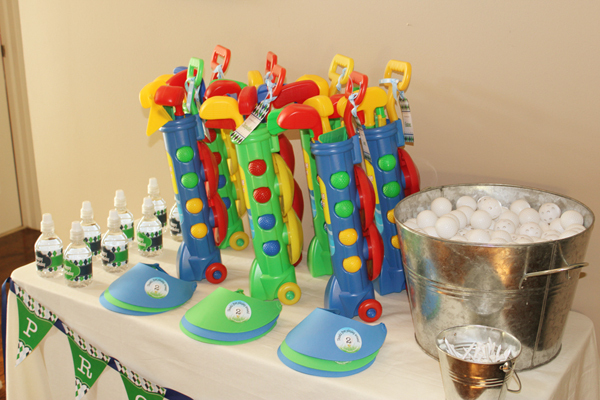 We had fun golfing games, snacks & treats and each little caddie even received there very own golf bag. The post was getting fairly large I decided to split it in two parts. 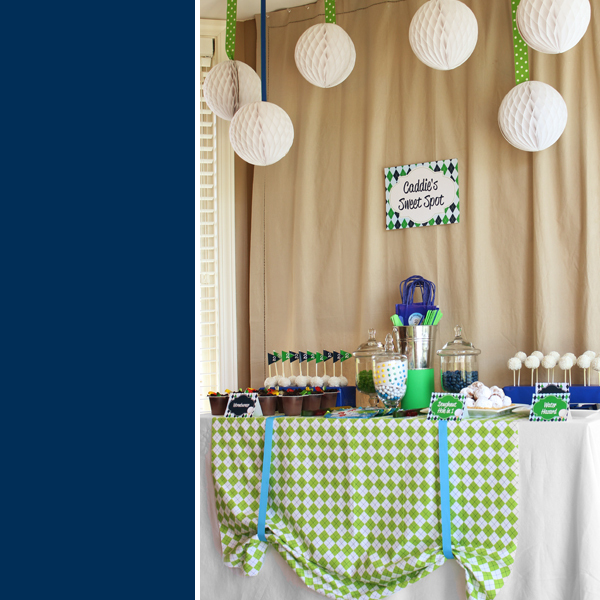 Part one covers the favor and dessert table and part two will focus on the food and games. Enjoy! Each “Golf Pro” received his/her own set of golf clubs (thank you Target dollar section for saving the day! 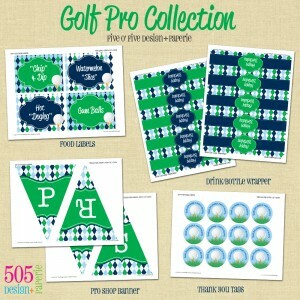 ), a blue or green visor I purchased at Joann’s, practice golf balls and a water bottle to stay hydrated on the course. I created the backdrop for the dessert table with a tan table cloth I had and pinned it to the window frame with thumb tacks (my husband wasn’t too happy about that one…opps!) 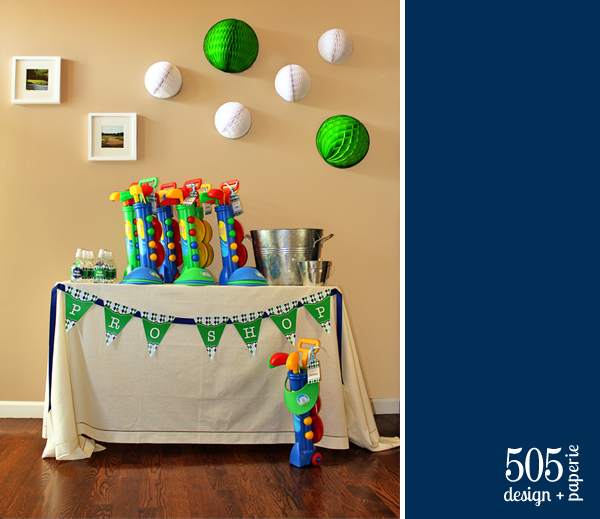 I used 12” white tissue paper balls that I purchased from Devra Party and hung them by grosgrain ribbon. 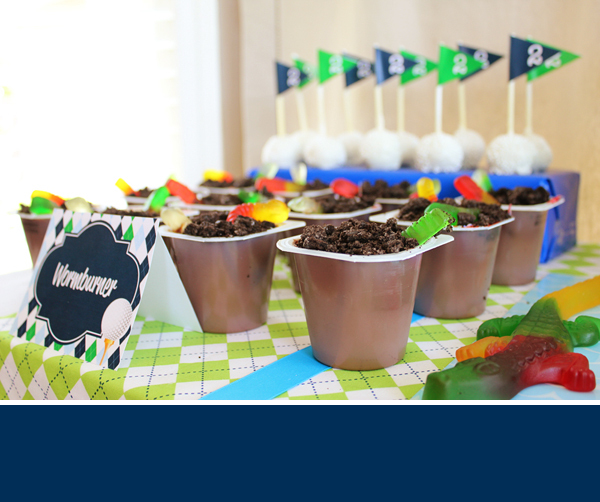 I wanted to use items on the dessert table that went along with the theme so I racked my brain for some golf terms. The sign over the table was “Caddie’s Sweet Spot” (sweet spot refers to the center point of the face of the club). 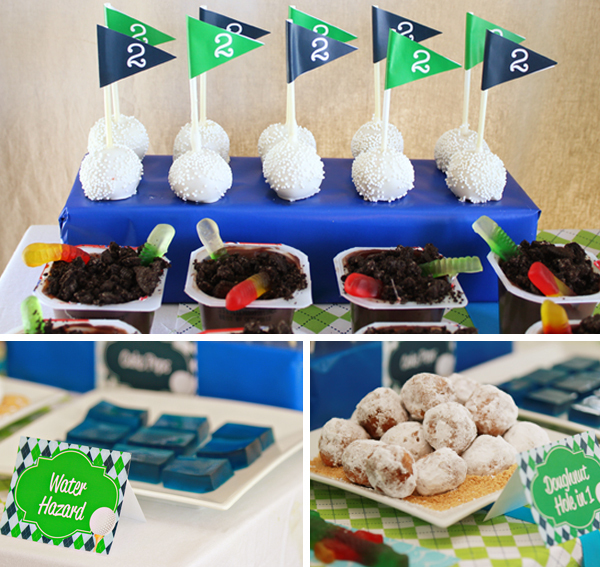 There was a “water hazard” ~ blue jell-o jigglers, “wormburners” (which is the term for a ball that skims the grass) ~ chocolate pudding pack topped with crumbled Oreos and gummy worms plus a sand trap of “doughnut hole in one” ~ made with powder sugar doughnuts and crumbled graham crackers for the sand. I also made cake pops that resembled golf balls ~ some like a lollipop and others with a golf flag and the number two for the birthday boy. The kids had a few candy choices and a small bag to fill so they could bring treats home. 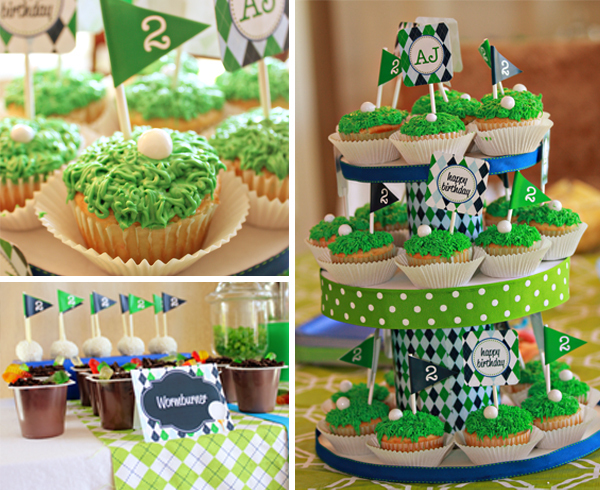 Green Grass Cupcakes, with white gumball and printable golf flags. Thank you so much to everyone who helped make this party amazing, I couldn’t have done it without you.